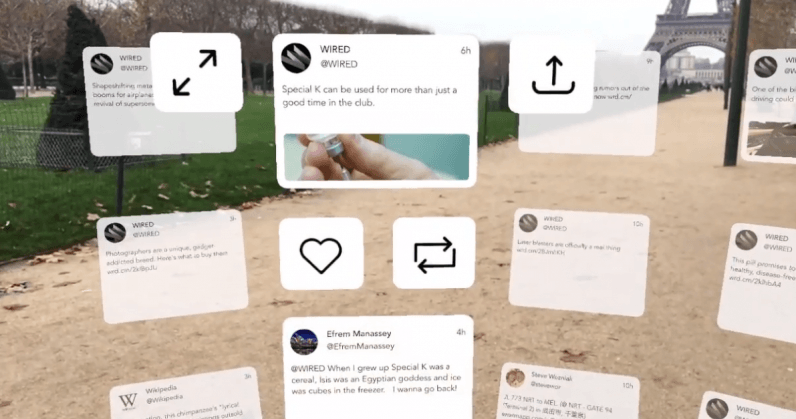 Twitter in augmented reality is exactly as cool as it sounds. TweetReality brings tweets, search, mentions, profiles and all your favorite features and displays them neatly on a virtual screen that overlays your iPhone or iPad display (sorry Android fans). Navigating is a bit different, but fairly straightforward and intuitive. You can still retweet, reply, and heart status updates much like you would on the mobile app. And while we wouldn’t call TweetReality a “polished” app just yet, it’s entirely usable and a great start. While AR is cool no matter where you use it, this is the type of technology that improves as better wearables come out to take advantage of it — whether that’s cool new AR glasses from Apple, or a slimmed down Hololens from Microsoft. TweetReality is available now. You can take it for a spin by downloading it at Apple’s App Store.